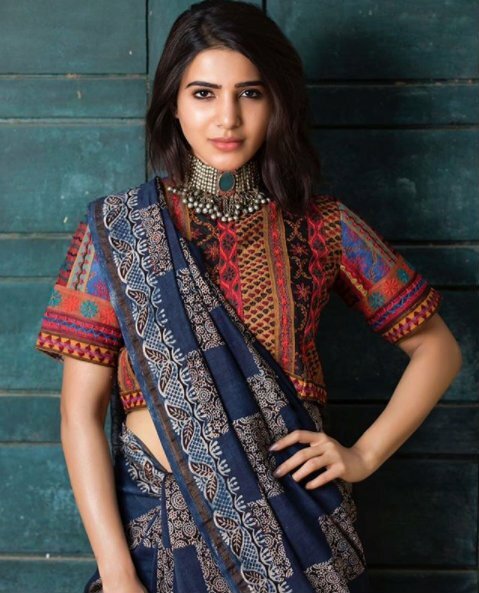 Samantha can be seen in a classy and elegant avatar in these photos. It’s no secret that 2017 was a pretty terrific year for the bubbly and lively Samantha Akkineni. In October, she walked down the aisle with her best friend Naga Chaitanya and added a new dimension to her life. Thereafter, she received some good news when Raju Gari Gadhi 2 opened to a reasonably good response at the box office and impressed critics. A horror-comedy, it was directed by Ohmkar and also had veteran Nagarjuna in the lead. A few days after that, she tasted success again when the phenomena called Mersal took the box office by storm and turned out to be a good Diwali gift for the ‘Thalapathy army’. Now, with 2018 in full swing and the previous year behind her , Sam is in the limelight again. As it so happens, some recent photos of the actor are creating a buzz amongst fans. In them, she can seen in a graceful avatar that she carries off like a boss. The outfit is a clear reflection of her love for the handloom sector. Her shy body language gels with the look and adds a new dimension to it. Interestingly, this is a busy time for Sam. At present, she has Rangasthalam and Irumbu Thirai in her kitty. Rangasthalam is a romantic-drama and has been directed by Sukumar. In it, she will be seen opposite Ram Charan for the first time in her career. And, as expected, this pairing has created a buzz amongst fans. As far as Irumbu Thirai is concerned, it is an action-thriller and has been directed by PS Mithran. In it, she will be seen alongside Vishal and ‘Action King’ Arjun. A while ago, she had said that that this is going to be the best film of Vishal’s career. So, did you like these pics of Samantha? Comments, please!